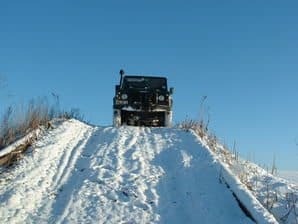 4×4 Driving – Brilliant Team Building even in the snow! If you are looking for some company team building , to motivate your staff, leadership skills or to reward your staff or entertain clients our 4 x 4 Land Rover Off-Road Driving Experience would be right up your street. Our fleet of recent model Land Rover vehicles including Freelander, Discovery, Defender and Range Rover, using almost brand new Land Rovers, some to the value of £80,000. This lasts around 20 minutes. With your vehicle, the driver will be blindfolded and it is up to the members of the team inside the vehicle to spot the big Scrabble Letters around the grounds and direct the driver to them. Communication vital for this to succeed! Tennis balls have been hung around the course and it is up to the driver to use his wing mirror as a tennis racket to hit each of the balls. If you want to have fun, we’ll make sure you have as much as you can handle. Need time for a team talk or presentation – no problem. Group dynamics are important so if you have different sets of people in your party, we have activities that will encourage them to integrate. We have several venues around the country which we can accommodate groups of almost any number. Our venues near to Milton Keynes in Buckinghamshire and Ashford and West Malling in Kent. This is a truly memorable event which will have all of your staff and clients wanting more, even in these snowy conditions which Britain is facing this event can still be run. Have you ever wonder what it feels like to drive a state-of-the-art 4×4 vehicle up a near impossible slope and then crawl down the other side? Contact us to find out and make a booking today. Drive Safely everyone in the snow! Happy New Year everybody, hope everyone had a brilliant Christmas and are looking forward to a great 2010!